Why do solutions of linear analytic PDE suddenly break down? What is the source of these mysterious singularities, and how do they propagate? Is there a mean value property for harmonic functions in ellipsoids similar to that for balls? Is there a reflection principle for harmonic functions in higher dimensions similar to the Schwarz reflection principle in the plane? How far outside of their natural domains can solutions of the Dirichlet problem be extended? Where do the continued solutions become singular and why? This book invites graduate students and young analysts to explore these and many other intriguing questions that lead to beautiful results illustrating a nice interplay between parts of modern analysis and themes in “physical” mathematics of the nineteenth century. 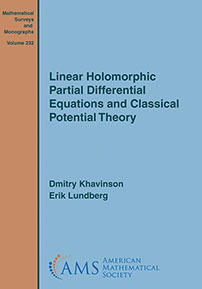 To make the book accessible to a wide audience including students, the authors do not assume expertise in the theory of holomorphic PDE, and most of the book is accessible to anyone familiar with multivariable calculus and some basics in complex analysis and differential equations. Graduate students and researchers interested in PDE, especially in holomorphic linear PDE. The book is written in a friendly but rigorous way and is aimed at good graduate students and young analysts.